All of us who suffer from gout struggle to find any way of making sense of our condition. We know that there is no cure, but how can we know if what we are doing is truly controlling it. This is a must for anyone wanting to manage their gout and prevent further flare-ups. 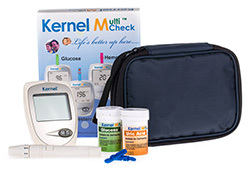 Checking your uric acid levels every couple of days or weekly enables you to keep a close eye on your levels in the comfort of your own home. Assessing and monitoring your uric acid levels will help you prevent a gout flare. The results will also help you to determine which foods or lifestyle changes are causing your uric acid levels to rise or fall. To help you keep a record and follow the rise and fall of your uric acid levels we have developed an easy to use graph. You will be able to download this after your purchase. The graph will automatically show the average of the results and allowing easy identification of any trends, whether these are an increase or decrease in levels. The graph can also keep a record of your diet or other factors if required. 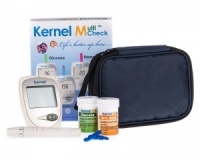 The meters are designed for both home use and for Health Professionals. They provide Uric Acid Test results in 20 seconds from only 4 micro litres of blood. The memory holds 100 test results. 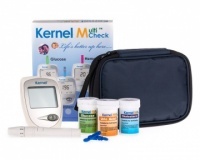 A little practice is required in order to get consistent results from the Kernel Multicheck meter. Just take a test on a regular basis and record the result. The graph showing the average will be your guide as it allows you to easily see the trends. We have a video showing how to use the meter as well as a very comprehensive instruction book, and our own observations, and we are at the end of the phone to help with any queries. Try to keep a record of your results together with a diary of the foods etc you have consumed. Plotting a graph can help you interpret the data. Personally I initially tested myself daily keeping a record of my diet and now once per week unless I feel the Gout “tingle”. I occasionally check my glucose and cholesterol levels. With every batch of test strips we receive a Certificate of Analysis the current batch is showing an accuracy of plus or minus 3.48 % of a laboratory Hitachi 7050 Bioanalyser. "I find that the reassurance of having the meter available, means that I can react to any sign of increasing Uric Acid levels instantly, without going through the process of worrying if that ache or pain is Gout!!"